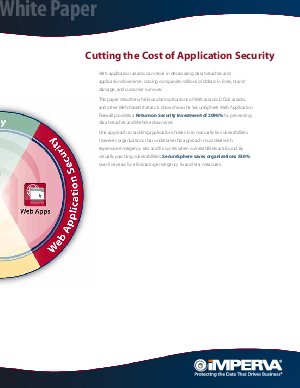 Web application attacks can result in devastating data breaches and application downtime, costing companies millions of dollars in fines, brand damage and customer turnover. This white paper illustrates how the Imperva SecureSphere Web Application Firewall provides a Return on Security Investment of 2090% by preventing data breaches and website downtime. SecureSphere also offers a compelling return compared to manual vulnerability remediation by eliminating costly emergency fix and test measures.